Apparently not every kid wants a pony these days. Now kids are evolving as their dreams and needs do, you might be surprised by how many kids want to be a superhero if not all. It is completely reasonable for kids to build their dreams depending on what they watch read and listen and nothing is more interesting for them than Marvel’s comics and stories.Imagining that they are superheroes gives them a chance to believe in themselves and have some level of power and independence which they do not have in their real world. Being one of the most loved superheroes Iron man has become a dream for many kids. Now it is time for your child to be a superhero, live like one and save the world. All you have to do is get the Hasbro’s AR Hero Vision helmet. Using modern technology such as AR Hasbro’s helmet brings you the world of the avengers to your home giving your son the chance to be one of Marvel’s most adored characters. 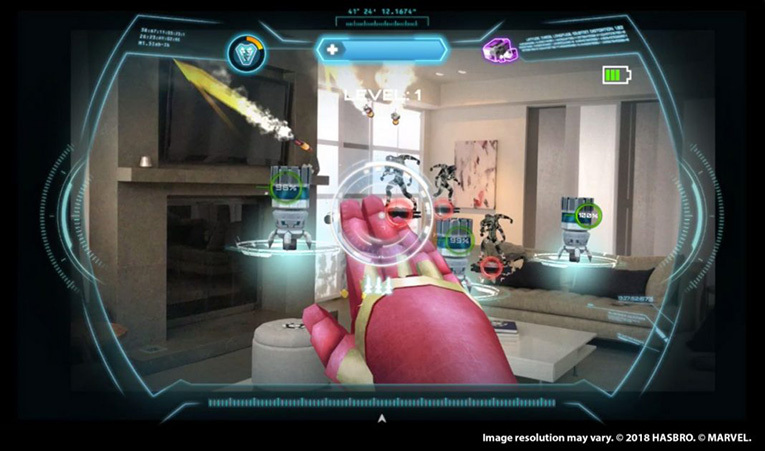 It is even better than virtual reality devices as it mixes the real world with fictional. Moreover, it also will provide your children a safe and funny way to play and learn. The good news is you don’t really need to be as rich as Tony Stark to buy the Hero Vision helmet. It is available and affordable all you need is 50 dollars and your smartphone, to get started buy the Hero Vision helmet, install the Hero Vision companion application and let your kid do the rest. The application is easy to use and compatible with iOS 6 and Android 5.The application has no in-app purchases they are rather replaced by the infinity stone pieces. You can get more infinity stones to improve your abilities. The Hero Vision mask in not the only thing you’ll get; you’ll also find the AR goggles, an AR gauntlet very similar to Iron man’s hands and three AR markers, and there is definitely more coming to help kids fight their enemies and save the world. With all these pieces and the application kids will have plenty of enemies to fight and many adventures to live not to mention the modifying and creating ability they will get, that will simply help them add new levels that match their interests. Using the Hero Vision helmet children will have so much fun and customizable levels. Hasbro assures that the headset is safe to wear for many hours which is very convenient for the targeted audience, however, the concerned age group is not precisely defined, but putting in mind the nature of the device and the provided safety we may assume that 8 year old kids are to be allowed. Hero Vision does not require Bluetooth or Wi-Fi technology, which means that there is no data being transferred. However the extended playing time could have some disadvantages like hitting an obstacle and falling to the ground, also wearing the helmet for a long time might cause some problems. But stay safe and get your kids an empty space and keep your eyes on them. Hero Vision will be available for everyone in spring 2018.You can buy it from toy shops in your city or get it online on HasbroToyShop.com. Here you can also buy the infinity stones to upgrade your powers and save the world.